Trump would be fun to play poker against. He’s got tons of tells. One thing that’s clear after tonight is that he gets rattled when people question his understanding of issues. The minute that Rubio and Cruz ripped on him, he became unhinged. He started making wild accusations. When the camera panned out, Trump’s posture was terrible, what with his jaw jutting out, his nose in the air. While Rubio and Cruz both had strong nights, Rubio’s performance was the strongest. He taunted Trump and laughed while he watched Trump disintegrate. At one point, Trump looked like a patient who hadn’t taken his medication for a few days. 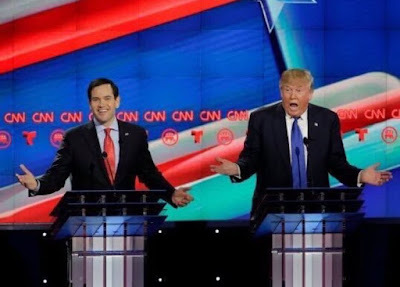 The important thing for Cruz and Rubio to do is to keep taunting Trump. Questioning his policies clearly got under Mr. Trump’s skin, too. It exposed him as an empty suit, something that hadn’t been done to this extent prior to last night’s debate. TRUMP: I may not be successful in doing it. It’s probably the toughest negotiation anywhere in the world of any kind. OK? But it doesn’t help if I start saying, “I am very pro-Israel, very pro, more than anybody on this stage.” But it doesn’t do any good to start demeaning the neighbors, because I would love to do something with regard to negotiating peace, finally, for Israel and for their neighbors. Apparently, Trump hasn’t figured it out that the Palestinians are terrorists yet. That’s stunning. Not taking sides between Israel and the Palestinians is taking the terrorists’ side. A couple points, number one, I do think it’s amazing that on this stage tonight there are two descendants of Cuban origin, and an African American. We are the party of diversity, not the Democratic party. When the first rumor got out that Jason Lewis was thinking about running for John Kline’s seat, the DFL’s opposition research staffers must’ve smiled for a week. As a former radio talk show host, and a provocative, feisty one at that, Lewis certainly wasn’t a stranger to controversy. It isn’t a stretch to think that the DFL will deploy their war-on-women chanting points if Lewis is the GOP candidate in Minnesota’s Second District. In 2014, I wrote more than a few articles about Mark Udall’s re-election campaign against Cory Gardner. This article, in particular, highlights the fruitlessness of deploying the war-on-women tactic. Sen. Udall used those chanting points too often, leading the Denver post to nickname him Mark Uterus in their article endorsing Sen. Gardner. The candidate most likely to win the DFL’s endorsement is Angie Craig. Based on her issues page, she sounds like a well-financed, cookie cutter progressive. After watching her debate on Almanac, I’m convinced that that’s who she is. She’s great at reciting her lines but thinking on her feet isn’t a strength. Let’s support and reward businesses that create jobs and invest in infrastructure and research and development in America. While there’s no question that Minnesota’s Second District isn’t as conservative as it was before redistricting, there’s no question that it’s suddenly a liberal district that will support a socialist. Without interfering in the race, the fact is that Jason Lewis would light this socialist-in-training like a Christmas tree. BMS should be sued for rigging an election. AFSCME’s unionization push doesn’t just affect in-home child care providers that care for children whose parents receive assistance. AFSCME wants to be the exclusive negotiator with government on a wide range of issues. Despite that fact, BMS is insisting that the unionization vote be limited to a tiny portion of the child care providers. NOTE: There are over 11,000 in-home child care providers. AFSCME knows that they’ll get defeated if all 11,000 providers get to vote. In fact, AFSCME knows they’ll get trounced if all child care providers vote. The legislation and unionization efforts will interfere with other child care providers’ abilities to negotiate contracts directly with their clients, the suit said. Since these are independent small businesses, they should have the right to pick the people they want representing them before oppressive governments. They should be able to change their mind on that decision a case-by-case basis. Isn’t it absurd that government is telling these entrepreneurs who can represent them in negotiating with that oppressive government? Distilled to its finest form, that’s what this rigged election is about. Donald Trump hasn’t stopped telling us how great of a businessman he is. Included in Trump’s schtick is his bragging about how he’s making fantastic deals with the Chinese. Another part of Mr. Trump’s schtick is talking about how “America doesn’t win anymore” and how America will win again once he’s elected president. Kevin Williamson’s article is utterly devastating. Consider Williamson’s article the official death of Trump’s schtick. In 2004, Trump Hotels and Casino Resorts, a holding company for various Trump properties including the Taj Mahal and a riverboat-gambling company in Gary, Ind., went into bankruptcy, having acquired $1.8 billion in debt while raising only $130 million through an initial public stock offering. Same story: Trump had borrowed too much money, at a rate he could not afford (15 percent, in fact, which lets you know how credit-worthy the market deems Trump to be), and once again he was obliged to give up most of his ownership stake. Trump’s second bankruptcy came with his acquisition of New York City’s Plaza Hotel. The great dealmaker did essentially the same thing with the Plaza that he had done with the Taj Mahal: He borrowed too much money at rates he could not afford. Trump Hotels and Casino Resorts was reorganized as Trump Entertainment Resorts . . . which promptly went bankrupt, filing for Chapter 11 protection in 2009. (That’s right: Trump, who wants to be president of these United States, was in bankruptcy that recently.) Too much debt at an interest rate that he couldn’t afford to pay? Check. Loss of ownership? Check. Trump and his daughter, Ivanka, both resigned from the board just before the bankruptcy filing. The great businessman who insists he’ll negotiate fantastic deals specializes in negotiating terrible deals that have led him into bankruptcy court 4 times. Each time, Mr. Trump did the same thing. He “borrowed too much money at rates he couldn’t afford.” Shouldn’t he have figured out that he was repeating the same mistake after his second bankruptcy? Trump, the great negotiator, didn’t learn after his second bankruptcy. Trump didn’t learn after his third bankruptcy. I don’t know that he’s learned after his fourth bankruptcy caused by “borrowing too much money at rates he couldn’t afford.” Rather than him campaigning on the slogan that he’ll “Make America great again”, shouldn’t he pay attention to his businesses and keep them from going bankrupt? There’s no question about whether Sen. Cruz’s GOTV operation is top notch. It’s the best on either side of the aisle. There’s a major question, though, about whether their communications team is ready for prime time. The fact that they just fired Rick Tyler indicates that it isn’t ready for prime time. More than a few questions are raised about whether the Cruz campaign should be targeting Rubio, especially on the non-issue of attending committee meetings. The fact that they’re targeting Sen. Rubio with those type of ads as opposed to taking on Trump is a sign that Sen. Cruz is pulling his punches against Trump. Whether that’s because he’s intimidated by Trump or whether it’s because he’s admitting he can’t win the nomination is anybody’s guess. Whatever it is, it isn’t a sign of strength. Republican presidential candidate Ted Cruz said Monday he’s fired campaign communications director Rick Tyler, after his top spokesman promoted a video that wrongly depicted Florida Sen. Marco Rubio as trash-talking the Bible. The Texas senator announced that he’s asked for the resignation at a press conference Monday afternoon. Sen. Cruz’s campaign is suffering. He fired Rick Tyler for questioning Sen. Rubio’s statements on faith but he hasn’t done anything with regard to the staffers that spread the vicious rumor that Dr. Carson was getting out of the race after Iowa. The point is that Sen. Cruz isn’t taking on Mr. Trump. Earlier, Sen. Cruz could argue that he wasn’t going after Trump because he was biding his time. That’s a fair point. The question isn’t at what point will Sen. Cruz unleash the heavy artillery on Trump. Rather, the question is whether he’ll continue pulling his punches. According to this NY Times article, Laura Ingraham wants the GOP to head in a populist direction. That isn’t leadership. That’s capitulation. That’s handing the nomination to Donald Trump. What’s worst is that it means our courts will be packed with activists whether Trump wins or Hillary wins. Ms. Ingraham is famous for lecturing the DC insiders for their failures. It’s time to lecture her for her foolishness. Populism is what got this nation into this situation. Populism is liberalism with a different name. Populism isn’t rooted in constitutional principles. Populism is prone to mob rule, which is just a step away from anarchy. Does Ms. Ingraham really want to deal with a system of government where the mob rules? Does Ms. Ingraham prefer government of and by judicial fiat? That’s what populism will give us. In fact, populism will give us that sooner rather than later. Ms. Ingraham isn’t really that stupid. You can’t be that stupid and be a Supreme Court law clerk. It’s possible, however, to misdiagnose the root cause of the problem. The economy isn’t failing because of globalism. It’s failing because our taxes are outrageous, the compliance costs of our regulations are crushing businesses and our regulations are designed to crush competition. When Mr. Trump argues that companies are leaving the United States, he’s right. It’s just that his plan to fix that won’t fix anything. The type of tariffs that Mr. Trump is advocating for kill jobs. President Reagan and President Clinton are the 2 greatest job creators of my lifetime. They both thought that the Smoot-Hawley Tariff Act caused the Great Depression. Most economists agree with that. Trump’s economic plans aren’t rooted in capitalism. They’re rooted in corporatism. Trump hasn’t talked a single sentence during the debates about helping small businesses create jobs. Trump certainly hasn’t said anything about regulatory reform. William F. Buckley once famously said that “A Conservative is a fellow who is standing athwart history yelling ’Stop!’” It’s time this generation of conservatives stood athwart history yelling ‘Stop’! It’s imperative because American exceptionalism is what’s on trial.